Christopher Parnell, 4, chooses a book at Leroy’s Barbershop on Lancaster Avenue in West Philadelphia. Placing free books in local businesses is one grassroots strategy employed by Read by 4th, the multimillion-dollar citywide campaign to improve citywide literacy rates. Leroy's Barbershop on Lancaster Avenue has all the trappings of a neighborhood gathering spot: a cozy, neat room, a narrow line of chairs with folks waiting for their turn for a shape-up or a fade, a steady, low hum of conversation — and an overflowing bookshelf that serves as a de facto children's library. Two-thirds of all Philadelphia third graders cannot read at grade level, a marker researchers say can be a make-or-break in determining if students succeed in school or make it to 12th-grade graduation. For the last three years, an early literacy effort known as Read by 4th has aimed to change that, with over 100 philanthropic organizations and partners large and small pouring tens of millions of dollars into a citywide effort to double the number of kids who hit that mark before fourth grade. Much of the campaign's work is focused on formal classroom instruction, with funders like the William Penn and Lenfest Foundations supporting efforts to bolster early literacy teaching in the Philadelphia School District. But another significant part is funneled into grassroots campaigns — everything from reading captains, who conduct trainings and serve as community resources, to book nooks in key small businesses. That's why Leroy Robinson Jr., the proprietor of the barbershop at 41st and Lancaster, has a thriving book nook and a crate with free books for children to grab as they wait for haircuts. When Robinson was first approached by West Philadelphia Action for Early Learning, one of Read by 4th's partners, and asked if he'd be willing to promote literacy by placing the books in his shop, he jumped at the chance, he said, nodding at Rikeyah Lindsay, reading to her 4-year-old son, Christopher, in the barbershop's waiting area. "It was a no-brainer," said Robinson. "Kids need to lift their heads up from the phones, they need to read, to learn, to engage their imaginations. Now they know, the barbershop is the place where you learn." Leroy Robinson Jr., owner of Leroy’s Barbershop on Lancaster Avenue, poses with one of his favorite books, Bippity Bop Barbershop. Rachel Honore, a parent navigator with Action for Early Learning, has placed crates of free books in shops up and down Lancaster Avenue to great success, she said. More and more, she's seeing children with home libraries, and parents eager to stop her to talk about reading. And business owners tell her they can't keep some books in stock — It's Ramadan, Curious George, and Afrobets 1, 2, 3. "Miraculous things have been happening," said Honore. "It's started this energy. I can't explain how much of a fire this puts in your belly." Down the road from Leroy's Barbershop, first grader Tailynn Conquest picked through books at Proclaim Enterprises, a computer shop at 37th and Lancaster. She likes picking out books, said Tailynn, "because it makes me smart." First grader Tailynn Conquest grabs a book at ProClaim Enterprises. Such efforts are crucial to Read by 4th, said Jenny Bogoni, executive director of the campaign. With more than 100,000 Philadelphia children in need of early reading intervention, no traditional programmatic approach could address that need, Bogoni said. According to Read by 4th data, 42 percent of all city third graders hit the mark on reading as measured by standardized tests taken by public and some private school students in 2016-17. In the Philadelphia School District, which educates the vast majority of students, the number was 35 percent. Statewide, the average among third graders was 65 percent. The share of third graders in the School District of Philadelphia who score as advanced or proficient in state standardized reading tests is far below the state average. The early-literacy advocacy campaign Read by 4th has set a goal of 85 percent citywide. "We need a public health approach to changing behavior," Bogoni said. "We're changing literacy habits throughout our community to help raise readers." That takes many forms — reading tips sent to parents' phones, summer reading programs, reading coaches who work one-on-one with students. One newly launched program is Talk It Up, which places conversation prompts in places parents and children frequent, like grocery stores; it will eventually roll out to health clinics, restaurants, and bodegas. Strategically placed signs might say, "Design your favorite hoagie — what would you put in it?" The more conversations parents have with their children at an early age, research says, the more it builds kids' vocabulary, setting them up to be stronger readers. That's also Erme Maula's goal. Maula, who lives in South Philadelphia, is a reading captain, a volunteer empowered to spread the gospel of literacy to her neighborhood. Her job is not to teach people to read but to connect their families to resources — trainings, free books, early literacy best practices. 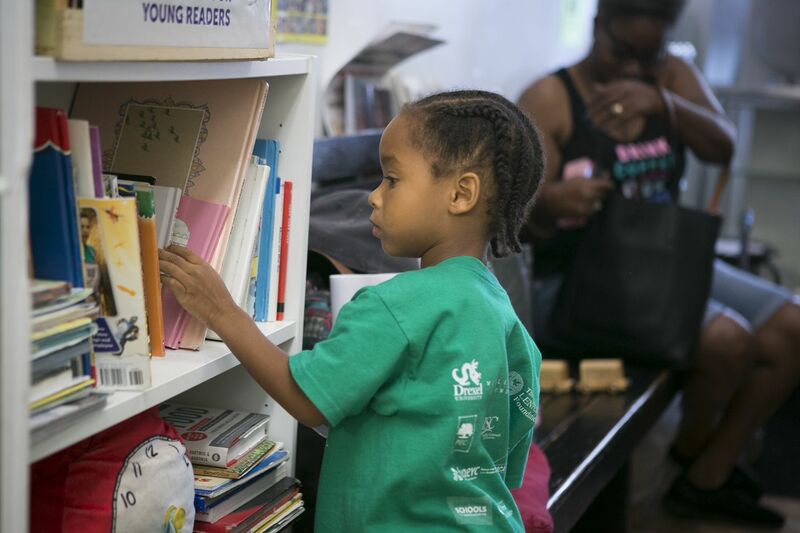 In her "Reading Captain" T-shirt, Maula, who is trained as an advance practice nurse, is a familiar face in South Philadelphia, pulling a wagon full of books to community meetings, keeping the library in Mifflin Square Park stocked, leading family workshops. And while measuring the impact of such work can be difficult, Maula feels as if she's moving the needle. "I literally walk around the neighborhood with a sign that says, 'Free books for your home library. Please take one,' " said Maula. "Literacy is something to rally around."